CHOOSE YOUR DREAM TRIP FOR Ü AND A MATE - FOR A CHANCE TO WIN*! $2,000 Travel Money Oz Currency pass and a $1,000 Student Flights Gift Card. Choose which trip Ü prefer: Topdeck's Aegean Sunseeker or Busabout's Europe Unlimited pass? Simply click on the trip of your choice below, fill out your details and hit enter for a chance to WIN! Prize includes return Etihad Airways flights, your choice of a Topdeck or Busabout trip, $2,000 Travel Money Oz Currency pass and a $1,000 Student Flights Gift Card. Choose which trip Ü prefer: Topdeck's Aegean Sunseeker or Busabout's Europe Unlimited pass? Simply click on the trip of your choice below, fill out your details and hit enter for a chance to WIN! Ready to bask in endless sun and take in the picture-perfect sights of Greece? 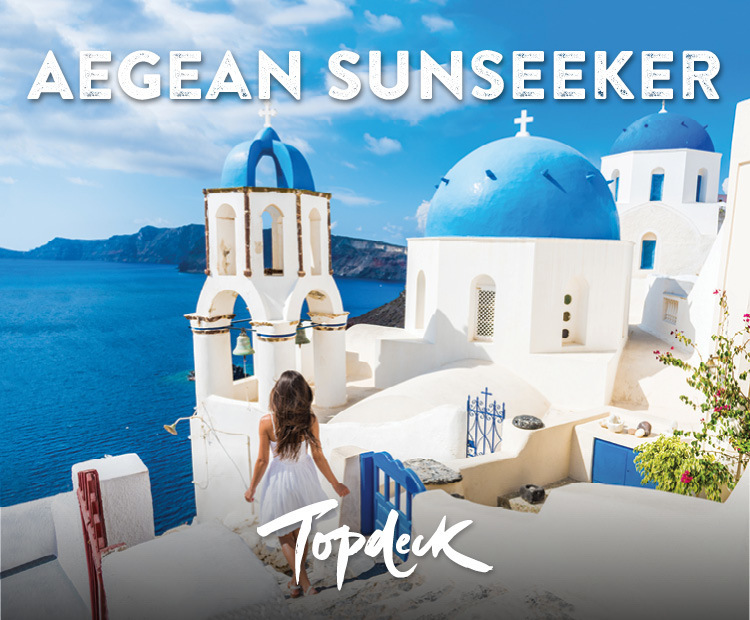 Sail the scenic Aegean Sea and embrace island life on Topdeck's Aegean Sunseeker tour. Depart in Santorini and end with a breakfast in Mykonos. Embark on your own European adventure! Create your dream itinerary with Busabout's Hop on Hop off pass. Explore over 47 of Europe's most iconic destinations including popular cities, landmarks & insta-worthy hidden gems! The winner will be announced on Monday 19 March 2018. *Terms and conditions apply. For full prize details & terms and conditions visit our website. Competition: Open to Australian residents 18-39 years nationwide. Prize: Entries open 10:00am AEST Monday 19 February 2018 and close 11:59pm AEST Sunday 18 March 2018. The prize winner will be drawn at 10:00am AEST Monday 19 March 2018 and will be notified by phone or email by 4:00pm Monday 19 March 2018. The winner will be published on the Student Flights website by 5:00pm AEST Monday 19 March 2018. Competition not open to Employees of Flight Centre Travel Group Limited, Etihad Airways, Topdeck Travel, Busabout, Travel Money Oz and their immediate families. Flight Centre Travel Group Limited (ABN 25 003 377 188) trading as Student Flights. ATAS Accreditation No. A10412. Authorised under NSW Permit No. 18/21802, SA Permit No. T18/177 and ACT Permit No. TP 18/00233.